The following is an extract from “Curieuse und rare chymische Operationes”, Johan Isaac Hollandus, 1714, Leipzig & Gardesleben, with some additional explanatory pictures and notes in red. “Now I will teach you how to make oils from metals, and to turn the innermost outside, which is one of the greatest secrets. [...] Take a large amount of Vitriol Romanum, 12 or 16 lbs., more or less. Note: Blue, or roman, vitriol is cupric sulfate; green vitriol - also called copperas, a name formerly applied to all the vitriols - is ferrous sulfate. White vitriol is zinc sulfate; red, or rose, vitriol is cobalt sulfate; and uranvitriol is a native uranium sulfate. Here a different Vitriol is meant. Dissolve it in Aqua Communa (Note: distilled water), and when it is dissolved, let it settle down. Pour off the clear from its feces, and set it into a sandbath to coagulate, using a good vessel. Let it evaporate until a skin forms atop. Now let it cool down. In this way the Vitriol sprouts into a beautiful green, which is the best color in the work. Put what has sprouted into a suitable vessel. Note: The term "sprouting" is used, since crystals will sprout from the surface or the bootom. Green is the best color of the work since it is thecolor of generation. Let the remainder also evaporate and sprout until you have it all together.Now put it into a room for it to dry. Let it stand in as much heat as the sun gives off in the summer. Then the Vitriol will turn white. 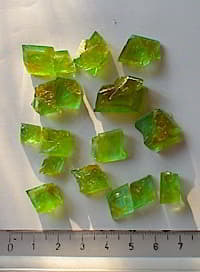 Note: The green crystals will turn white and brittle when subject to a gentle heat or sunlight. Best is direct sunlight. A white powder will result. 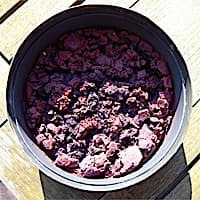 This powdre should be stored in a dry place, otherwise it will slowly attract water again and turn greenish. Dissolve it again, and more earth will drop to the bottom. Decant it, let it evaporate and sprout again, as indicated in the foregoing. This can be accomplished within 3 to 4 days. The Vitriol will become twice as beautiful as before, and much greener, so much so that you will not have seen a more beautiful green color. Therefore Hermes and Geber speak: Preserve well your green, evaporate well the wet until a skin forms on top; then let it sprout again, and continue to do this till you have your Vitriol together again. Put it once more in a room, as before, drying until it turns white. Then dissolve and granulate again. Repeat until no further feces are left. Put aside until you need it. 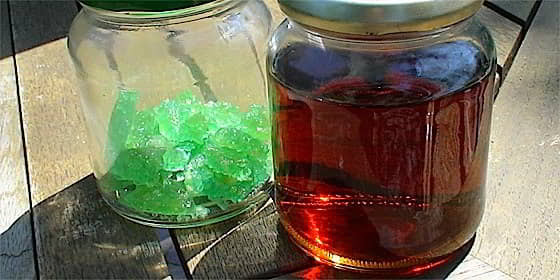 Note: Above picture shows the red purified solution, after one cycle of purification in the sun and re-solution. 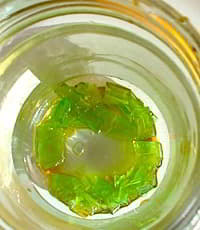 From this will sprout crystals with a more transparent vitriolic green color. Now then, someone might say: When the Vitriol has been dissolved, why do you not let it evaporate completely, but you allow it to sprout, and it requires a great amount of time to change it into a white powder? Note, then, that Vitriol has within it, a subtle spirtus, as is described in the Vegetable Work as regards the subtle spirits, which are in all herbs outside. It is the green (or: verdure) of all things that are green outside, for it is the flower of their right essence. If you lose the greenness, I am telling you forsooth, that you are deprived of the essence. Further, whatever work you are doing with it, it is all lost, in vain, for it has been deprived of much, its soul, life and essentia, corpuse, spiritus or roots and everything green outside. Take care then, to preserve that well, for it is so subtle that you can lose it without noticing it, as indicated in the Vegatabiil. There you are taught that the green in all herbs, leaves and roots, is to be extracted from everything that is green on the outside. And when the green has been drawn out and reversed into a beautiful redness, the like of which none has seen, you have the right essentia. Look for further instruction in the Vegatabili. This is the reason why it is necessary to preserve the green of the Vitriol. If you were to coagulate it, part of its greenness would be taken from it; for it would become yellow, yet the green is in the Quinteesentia that we seek in the Vitriol. That is why you must permit it to dry and sprout in a room. Then its greenness is covered with the white, for as soon as it becomes moist again, its greenness will re-appear. Note: This is indeed reproduced when does not store the white powder in a closed dry place. 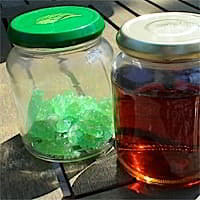 It will slowly attract moisture to itself and reform green crystals. Allthough it may still seem a powder, the green is basically from the (micro)crystals that are being formed. Thus the outermost of the Vitriol must be turned into the innermost, and the innermost must come out, in order to preserve its soul and its spirit and to retain its Quinta Essentia. This is a great Mysterium or Secretum in our Art. When the Vitriol has thus been cleansed, it is as red as a rose or ruby. It has within itself the four elements in their perfection, and this is the stone which God has given us for nothing. You should now take the white powder which you were told to put aside and place it in a phial and close it with Sigillo Hermetis Set it in ashes and heat it by a lamp, as warm as the sun shines in the midst of summer. Keep it thus, until you see that it begins to turn yellow Let it stand further until it turns completely yellow. Note: Experience shows that the temperatur needs to be quite a bit higher than "a warm sun in the midst of summer". 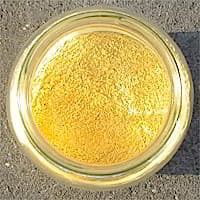 Increase the temperature slowly upto 200 degrees C. to arrive at a yellow powder. Then, let it stand yet another ten days and see if it does not begin to tinge a red color. Then, increase the fire a little, and if it becomes more red, let it stand in the regimen of the fire as is If however, it does not become somewhat redder in 8-10 days, increase the fire by one lamp until the color increases. If it stays the same, add yet another lamp, thus each time increasing the heat by degrees until the color changes to a rose or ruby red. When it has become a high or deep red color, let it stand yet another 8—10 days in the same heat and watch if the color does not change into a color different than red. Note: A regular fire can turn the powder red. Increased heat, for example in a kiln at 800 degrees C. will result in a purple powder. This should be done as a dry distillation, and the milky fluid should be collected. Now the matter has been reversed and its innermost has been brought outside. In this way, you will not lose the greenness if it has been reversed into redness. This is because it is in the deepest inner parts and can no more be brought out It will forever stay red and unfixed, for if it were fixed, everything would be lost, because it would have to be dissolved in water and coagulated again, and afterwards distilled over the helm. I am telling you that I have never revealed to you greater secrets than this! I am telling you, by my God, that this secret has never been set down into writing by the philosophi except by my hand alone. Moreover, I am telling you that there is no greater secret in art than this. Therefore, I beseech you and all those who will understand it, that you will never bring it to light except where it is right to reveal it, by the damnation of your soul, for it is a Secret above all Secrets, since with this matter all metals can be turned into oil, when they are dissolved in Aqua Fort, when the calx has been beaten to the bottom and processed as required. All Olea Metallorurn turn red as blood, without [...] for all metals are red in their innermost, but one is redder than the other. When they have been brought to redness, you must dissolve them, again coagulate them until they are free from all feces and they have their elements perfectly joined (together); for once they have arrived at this stage, nothing is left but feces.The earth, too, has become subtle and liquid and is dissolved in the other three. When they have thus been made subtle, with dissolving and coagultaing, you can distil it over the helm to a red oil, as you will learn As you are working with vitriol, you must also treat [...]. After it has been dissolved in Aqua Fort, beaten down, decanted from its saltiness and dried, you put it in a glass the same as has been done with the Vitriol. Or you can put a sublimated Mere. into such a glass, proceed in the same way and cleanse it of its feces, and distill it over into a red oil. In the same way can be processed. What do you think? Is this not a great Secret? Never before has anything like it been heard. Open your ears therefore, listen and understand! Now we will return to our work. When you see that your matter remains in an oily state, take it out of the ashes and put it into another, strong, glass. Pour a goodly amount of wine vinegar upon it, and set it into the balneum to boil for 4 days, often stirring it with a wooden spoon. After the fourth day, let it cool down and settle. 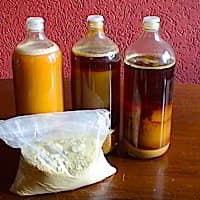 Decant off the clear liquid and pour more vinegar upon the remaining feces Add more distilled vinegar, and repeat three times Now throw away the feces and put an alembic upon the glass containing the solution; draw off the vinegar, so that the matter becomes quite dry. Now you have the matter at the bottom of the glass and much more beautiful than before. Again, pour fresh vinegar upon it, and treat it as above. Reiterate this until no more feces remain in the Solution. Then coagulate it to a dry powder, put a helm on with a large head (caput) and distill. First you will obtain a yellow spiritus, then red oils and finally a white epiritue. Let the matter cool down, remove the receiver and its contents. It is the blessed Oil. Preserve it well until you need it for your metallic salt. At the bottom of the alembIc you will find a matter that is as white as snow and as clear as crystal. It is the rectified matter of the aforesaid materia. It can be pulverized and imbibed Into the red oil as into its own corpus. Put it in vitreumapuliarn and hang it in tripodem for 40 days in moderate heat. Now it will coagulate into a Lapis Philosophorum which will dissolve all metals into ~ But we will not do this now, but will work toward our Salt and oil of metals in this manner, as with Vitriol. Thus the element of earth will go over with the oil, red as blood. This the earth of Vitriol does not do, as its oil separates from the earth.